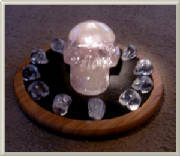 The Crystal Skull Whisperers are a group of Reiki Master/Teachers, Skull Caretakers and Communicators. 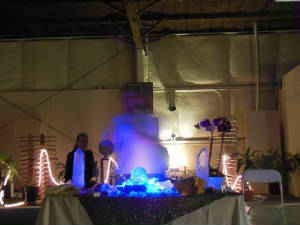 We offer a Trilogy of Activations and Attunements consisting of The Crystal Skull Activation, The Atlantian Crystal Activation and The Elemental Earth Star Empowerment. We perform Earth Healing Ceremonies and Skull Energy Healings. We also offer a Skull Introduction Workshop. 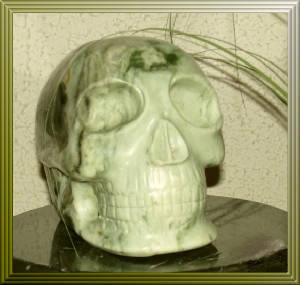 It is our privilege to be the caretakers of Many different Skulls with a human size JADE Skull being one of these many treasures. 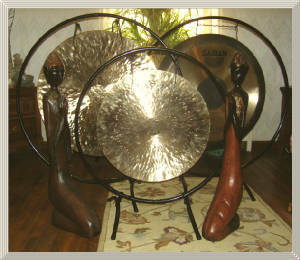 We also do "American Indian Drumming" and "Healing with the Gong". 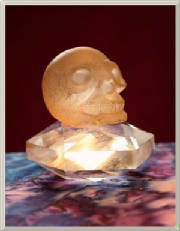 Please check out the Side Bar for more Crystal Skull Information and Working With Crystal Skulls etc. JADE is almost 7 inches in length and 12 pounds in weight. She has been next to Synergy an Ancient Skull for over a year. Kuan Yin works through the matrix of Jade as do several other High Beings of Consciousness. Please keep the Sun, Mother Earth and all Her Kingdoms in your prayers. Mother Earth is getting ready to birth into Her Ascension. Send The Mother your love. The 13 Crystal Skulls are an Extraterrestrial Technology which through the crystal pierce through all programming of the mind and open the DNA itself for new ideas. The 13 Crystal Skulls represent 12 Planets and in the center the Collective Consciousness. Within each crystal skull is the Akasha of the Planet where it was formed. The magnetic electric energy is transmitted from the skull when placed with the others and with the Ark technologies transmits an energy to our Collective DNA all at once to raise the quotients of light and love held in our bodies. DNA programing is both magnetic (Love) and plasma consciousness (Light). Liquid light and liquid love carried through our bloodstream to activate the heart beating and the nerve cells to light the path for the Body-Mind-Soul to enliven our life streams. Ascension in the body means you then are able to end your life and go on to the next as you see fit. In your timing. The end of death. Immortality. These 13 Crystal Skulls are now placed as 12 in the circle with the largest, the 13th in the center. The Stars represented in these carved skulls are: Pleiades, Arcturus, Antares, Andromedeans, Procyons, Lrya-Vega, Virgo, Orion, Dracos, Ursa Major and Minor (Bear) and Sirius. 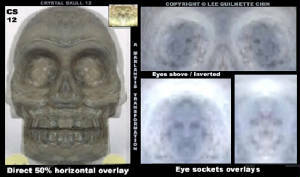 The 13th Skull connects all the knowledge from the sacred Planets together with the Ark Technology and is how those on Earth will be able to handle the Truth that benevolent Extraterrestrials have been working in their governments and all segments of law enforcement to position to give a hand up. This was necessary as the very agressive and powerful group mind of the elitists and cabalists stacked the deck. The 13 skulls positioned at Potala Palace in Tibet, an opening to Inner Earth, are key to connect both civilizations with millions of Ships which will be landing on Earth to bring support of technology and mentoring as Earth becomes the 33rd Planet Member in the Intergalactic Confederation of Worlds. 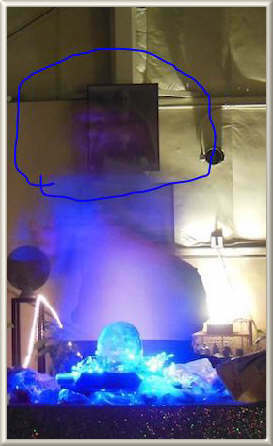 They spin and emit purple light as Oneness connects through them downloading the Diamond Light Codes directly to your own DNA matrix of consciousness. You may have been feeling it lately? Please be discerning when reading the entire channeling. 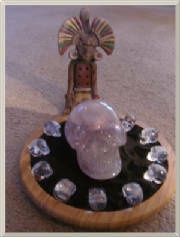 Carole's (a memeber of The Crystal Skull Whisperers) experience with "MAX" The Ancient Crystal Skull. I began to weep. Emotions flooded out of me like a child being reunited with a loved one. Only this was the loved one for us all. Our Father. Our Cosmic, Universal Father. I knew this to be true. "With All Channelling's I Ask You To Be Discerning"
With so much information being given by so many channeller’s and not all being in agreement as to how this Ascension will come about and what will take place upon our precious Earth before hand….please go within you heart and ask your Higher Self which path you are to journey upon and mainly which one you feel most comfortable with. NEVER give away your personal power to anyone or anything. There are Many Forces “out there” so we must be very discerning. I myself am aware of ALL that is being said but mainly take a “wait and see attitude". If and when anything transpires then I feel I can at that moment make the most spiritual choice for myself. I pray you too will do the same. May many Blessings be upon you. Messages given by Jesus-Lord Sanada from The Amethyst Group "Amethyst-Revelations"
SHEILA: Will any more crystal skulls be found, dear Master? LORD SANANDA: There is one to be found and that won’t be found for a while but when it is it will shock your world, it will rock it - I think that is the word - it will rock the world. It is buried where two religions clash constantly. Please visit this site if you are interested in many diverse channellings about the "Ascension"
"What many of you feel regarding the 12 + 1 is the inner urge to rediscover within the original pattern as transmitted by the Crystal Skulls. That is why many of you are now sensing an ancient call to acquire a 'modern-carved' model, and begin allowing it to work with you. With it you can awaken the 12 strands and combine to the completion of the 13". "So those attracted to the skulls then receive as within their acquired model, a portion of the whole, and the skull become by agreement, a teacher of greater truth and offers glimpses into the perfection hologram. That is why some are now being called to acquire the newly cut skulls, for indeed they open the pattern, they become teachers. They become allies and protectors for each of you on the path of Mastery, and they manifest at the time you awaken to that call." According to Joseph the Caretaker of Compassion.. 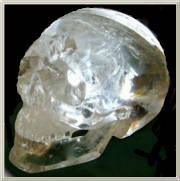 The Mayan prophecy stated the 13 skulls saved from Atlantis were to be "Human sized Clear Quartz with a "removable jaw." They were suppose to be able to sing and talk at ceremonies that way. Compassion is all of these things with no past. It is up to the observer to make their own decisions during a quiet meditative state. The point seems to be, WAKE UP AND REMEMBER OUR PAST!" To prepare for the coming evolution of Gaia, centered in our hearts, coming from Love, Humility and Compassion. I feel then we will be able to accept the huge energy blast we will be receiving. 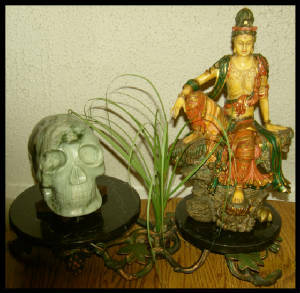 The above photo was taken of “Compassion” The Crystal Skull by a Guest, Candy Law in Stockton, CA. Compassion was being shown by Caretaker Joseph Bennett. JOE has written a book..The Crystal Skull Compassion. You can go to: <https://www.createspace.com/3558781> and order the book. 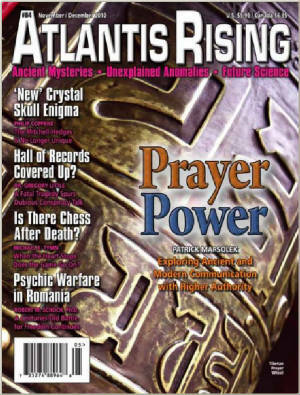 The magazine Atlantis Rising has an article about Joseph and his Crystal Skull "Compassion"
It states....."The Mitchell Hedges Skull Is No Longer Unique!" Please click on the site http://www.atlanteanskull.com for more information. New: Susanne Toro interviews Joseph on Blogtalkradio. If you will notice this Skull has what is called a CAP on the top of the head. Not very common to find. 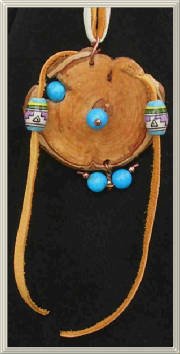 Bob is now offering a very special and Unique hand made pendant necklace made from Lilac Wood and Lightning Struck Jewelry. 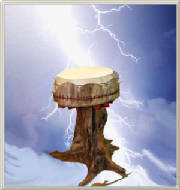 Also take a look at his awesome hand made Lightning Struck Drums and many NEW exciting items. http://www.theskullwhisperers.com/id83.html to view Dee's web site. 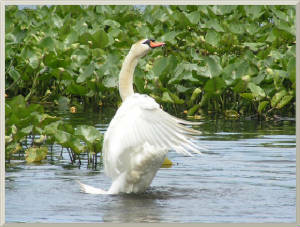 There is also information on "Feathering"...feathers used in healing. Please click onto this link and scroll down to the second article. http://www.theskullwhisperers.com/id87.html Please click onto this link for more info. There are several translations for this Mantra. "Behold the jewel in the Lotus" being one of them. It is the Mantra of the Buddha Kuan Yin....The Buddha of Divine Mercy and Compassion. This Web Site came into being August 2008. Founded by Marjorie Harriz.